Formally trained with a Ph.D. in Philosophy, Patrice Koelsch began sitting at Common Ground Meditation Center in 1995. 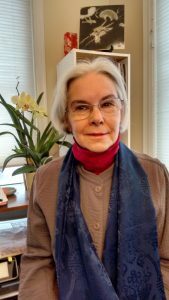 Patrice is a graduate of Spirit Rock’s Community Dharma Leaders Program, and completed a year-long Buddhist Chaplaincy Training Program at the Sati Center for Buddhist Studies. She has practiced meditation at monasteries in Thailand and Myanmar. Patrice has been facilitating meditation groups in correctional facilities since 1999, and has a special interest in offering mindfulness and loving kindness practice in non-traditional settings. She is currently the Program Coordinator for the Buddhist Chaplaincy Certificate Program at United Theological Seminary of the Twin Cities. Patrice is authorized to perform weddings, baby blessings, and memorial services. To listen to Patrice’s talks, click here.